Mark and Pat's Adventures: The Grand Portage to Lake Memphremagog. The Grand Portage to Lake Memphremagog. The question in traveling by water from west to east in Vermont is how to cross the Green Mountains. 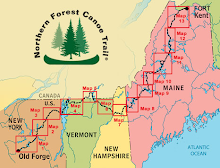 The trail founders decided to cross between the watersheds far to the north, and that is why the Northern Forest Canoe Trail goes into Canada. The crossing is still a portage, but need not climb to the heights of the Green Mountains to the south. Officially the longest portage on the trail, it is called The Grand Portage. It starts just north of Masonville, continues along Chemin Peabody, and ends at Perkin's Landing. Total distance is 5.7 miles. People living along the way are friendly, ask if you would like a ride, need water or anything else. Although long, the road is easy to wheel and getting over the hills just takes determination as compared to the skill required of other portages. Just past the start. Survival, just what I was thinking about! Close to the end... the wheels are still on and working. Almost to the end when the Jewetts General Store comes into view. Time to have a snack and talk with the owners. Three sisters have kept running the store as second generation owners and it has a constant stream of customers. Boat dock down one road, ski area down the other. Reached the lake, Perkins Landing and called it a day. The small park is open to thru-paddlers for overnight camping. Boat dock beside, small beach, good views. Nice place to camp for the night.